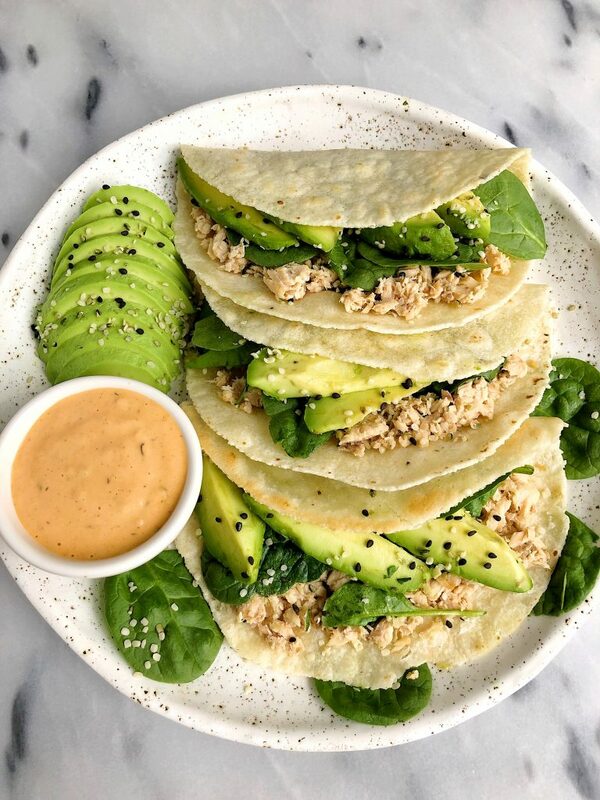 Healthier Crispy Pan-Fried Salmon Tacos made with just a few gluten-free ingredients for a simple and easy homemade lunch or dinner! When it comes to making a quick and easy lunch or dinner, I’m your girl. I also specialize in cooking for 1-2 people these days since I’m usually eating solo during the week at home. J works pretty late Mon-Thurs so he eats dinner at work. That means I’m shoveling food down my throat while catching up on my book manuscript, emails and blog work. I like to make meals that aren’t going to mess up the whole kitchen just to make something that is 1-2 servings. I know ya feel me. As soon as I moved out of my parent’s a few years ago, I finally knew why my Mom never wanted us to make a mess in the kitchen. You have to clean it up after.. HA! These Healthier Crispy Pan-Fried Salmon Tacos hit all my must-have’s when cooking lunch or dinner for myself. It has to be in one pan (check), filled with carbs, fat and protein (check, check, check) and it should be ready in under 15 minutes (check!). 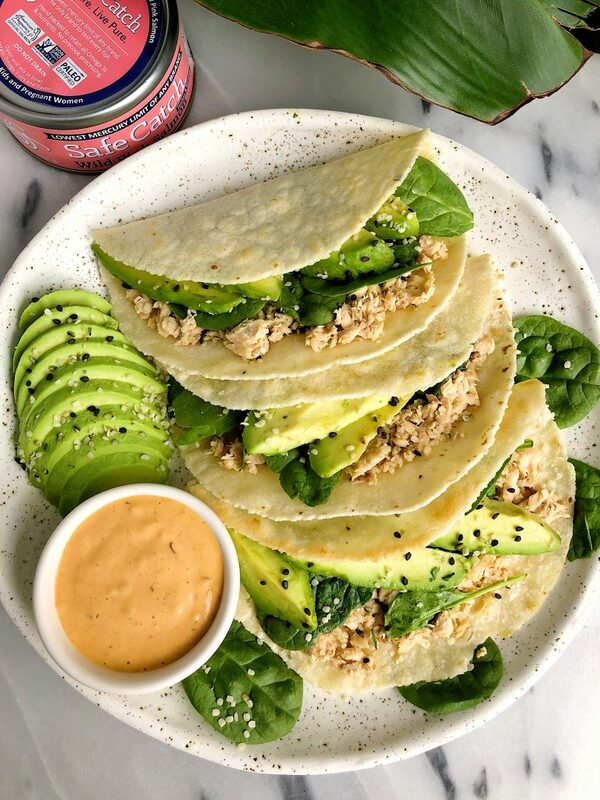 I love that these crispy tacos are filled with wild salmon from Safe Catch (a must have in my pantry) as well as some organic leafy greens, avocado and I usually serve them with whatever side dish I have prepped. Lately it has been sweet potato fries. Who am I kidding.. it is always sweet potato fries! You’ll only need your favorite tortillas, wild salmon, mayo of choice and whatever toppings you’d like to make these. Plus a little avocado oil to grease the pan and get them extra extra crispy (just how I like them!). I highly recommend getting the Safe Catch Wild Salmon and keeping it in the pantry. 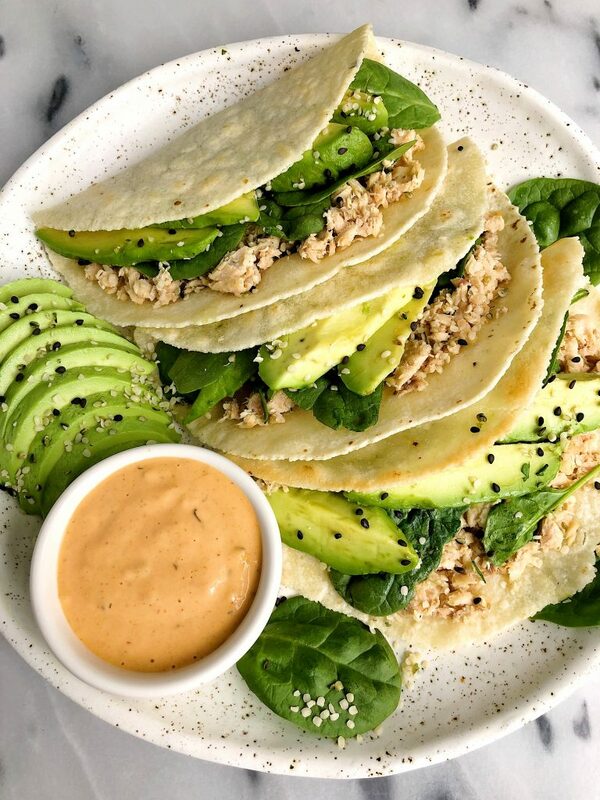 You can make easy tacos like these or Paleo Jalapeno Salmon Burgers, Basic Healthy Salmon Burgers or Spicy Salmon Quesadillas. All using their amazing canned salmon, which is the lowest mercury of any brand (safe for me while pregnant) and they hand test every single batch. It is amazing! Hope you guys love these crispy tacos as much as I do. I cannot wait to see your versions! Thank you Safe Catch for sponsoring this post! It means so much to me to partner with brands I love and believe in on the blog!